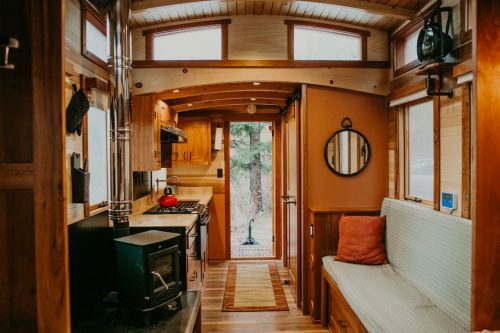 A 204 square feet lofted tiny house on wheels in Carlsbad, California. 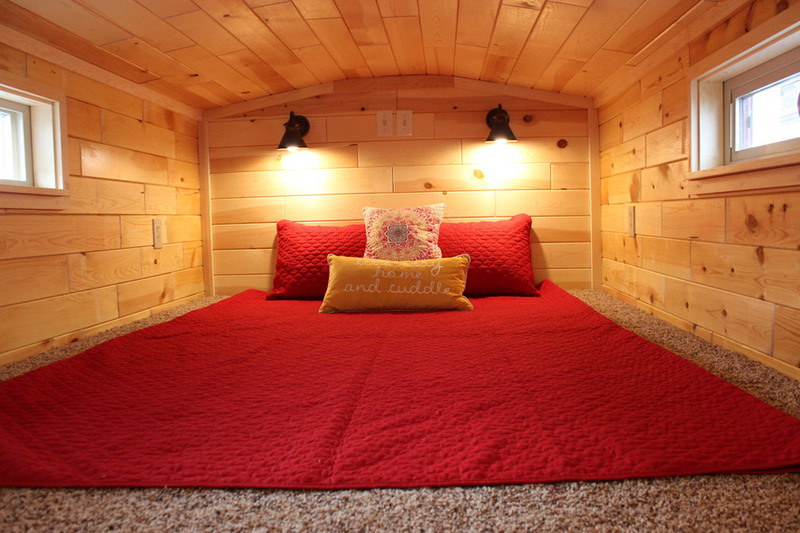 Built by Tiny Treasure Homes. More info. here. Very nice but… where is the kitchen table, the chairs, the sofa and the bed (mattress)? Absolutely stunning. This is my kind of Tiny House! 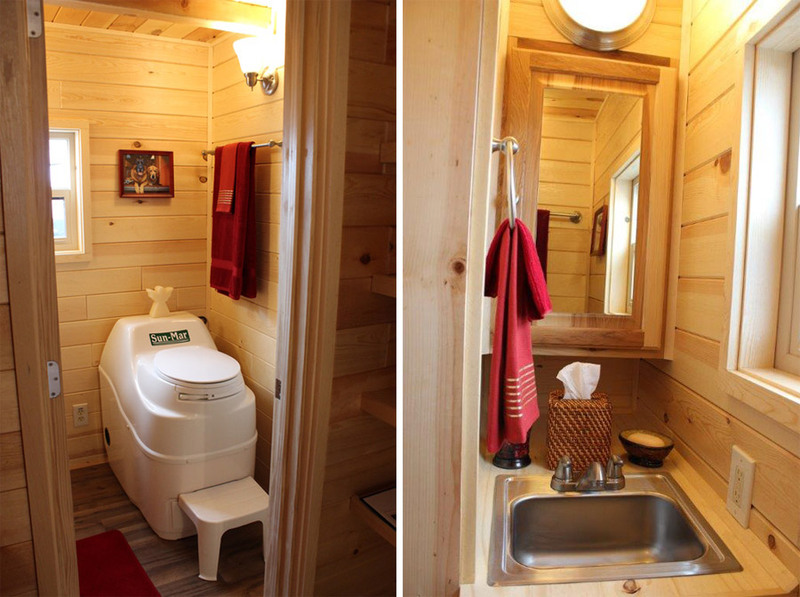 I love coming to this page and others and looking at all the different beautiful Tiny houses. The first time I saw the show I was hooked. I would love to live in a tiny house, it is my dream. I think about it night and day. The creators of them are so unique in their architectural designs. I am disabled and can’t work any longer due to a lot of my issues. We went from living in a 3bdrm apt appt to moving to VA and living with my sister. 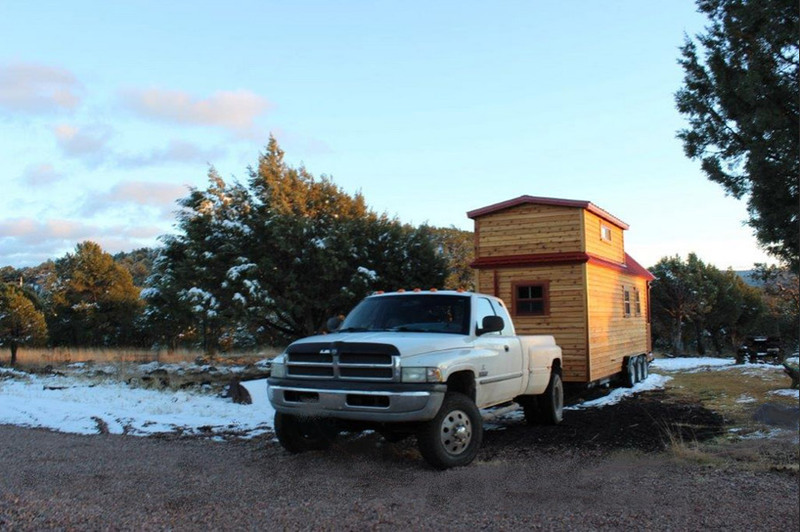 I had to send my son to live with his dad am trying to get help with building or buying a tiny house. I am only 45 yrs of age and have lots to offer. If your interested you can check out my web page. http://www.facebook.com/House4TammiDean If it weren’t for God and AA I don’t know where I would be. I am truly grateful to all. Nicely done overall, Good placement of windows, but I think using the same small size window throws me off. I like the small window in the bathroom, but the windows in the living room/kitchen are a few inches too small. Its disconcerting. The loft is slightly claustrophobic with only those two small windows for my taste. Love when I see a wash/dryer, the storage, the steps and general layout. It will make someone a happy home. 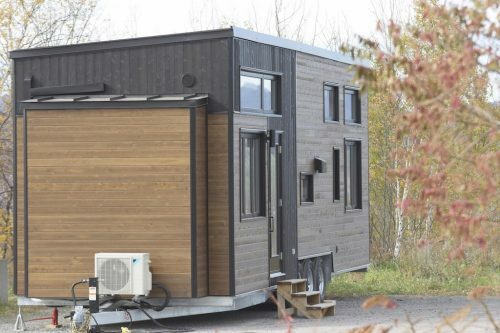 I’m just the opposite; I like the smaller windows for three reasons: (1) security; less opportunity for a break-in, (2) more wall space to put things on, and (3) less surface for a heat transfer to the outside when cold/snowing. I love the staircase, but I would make each step a storage box. 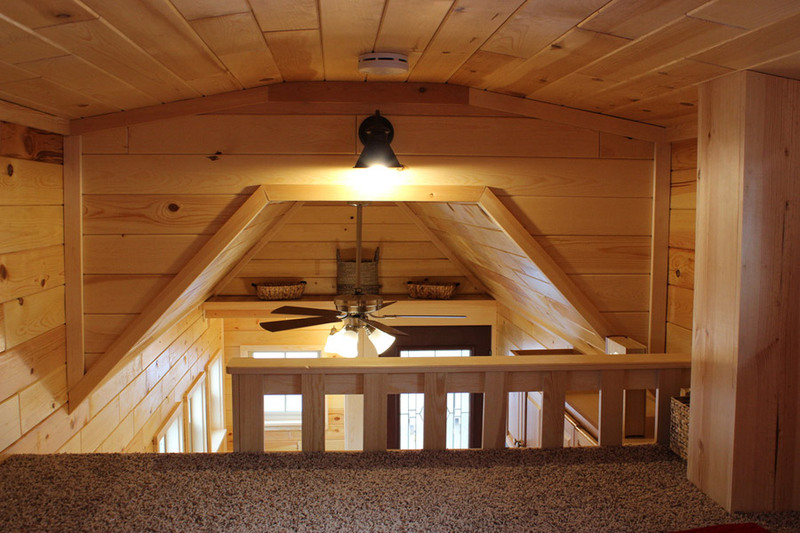 To me, the bedroom looks spacious (in comparison to gable lofts where one is bumping their head every time one turns over; now that’s claustrophobic!) 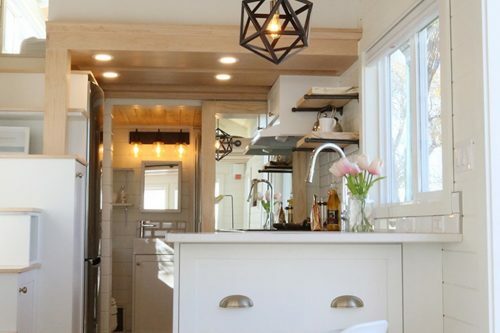 And I love the cabinets over the kitchen area. There needs to be some place to sit down and possibly a hassock could go into the alcove space next to the door with a drop down wall table (from Ikea) which would give an instant dining area. Or, put a board across the alcove for a desk/table and put a chair at that station. The kitchen sink is nice and big but I would prefer an even larger country kitchen sink I could divide into two with one or two plastic dish tubs. Love the washer and dryer combination. I like this THOW very much because it is clean, spacious and very functional. It would be perfect for business and anyone who has to travel a lot. 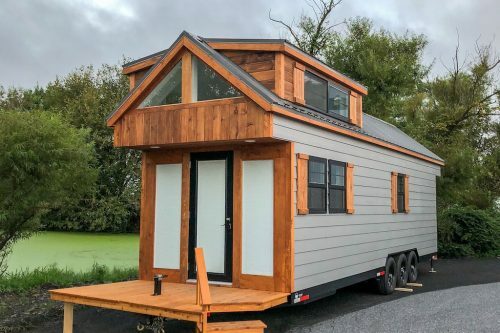 this tiny house is amazing. I love it. Great job. thank you for sharing. Under the stairs should have been used for storing hanging clothes. I believe there is a small black fridge beside the staircase. 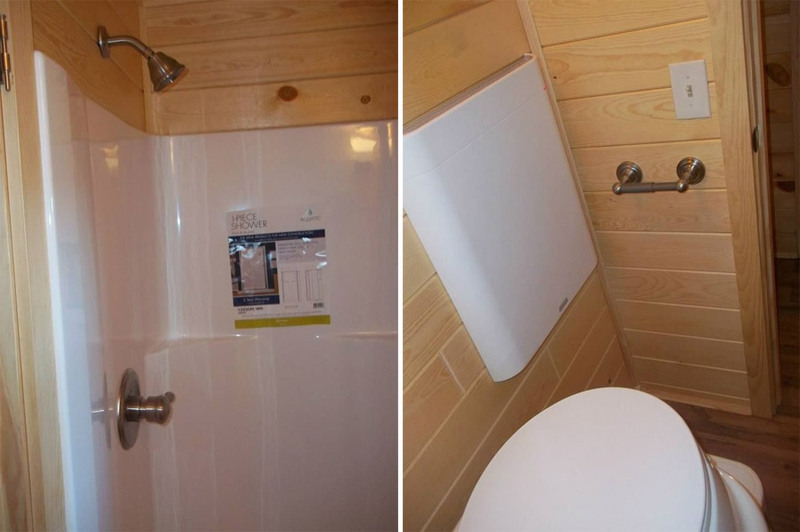 I have to agree with the No seating for meals or living room, Also why would you put the toilet so close to the wall. If you are left-handed. You would have to sit sideways to clean your bum. Just sayin.